National Evangelist Regina B. Howard is a motivator, teacher, preacher, servant, radio/TV host and mother. She was born in Waukegan, IL and is a humble dedicated woman of God. Anointed, appointed and positioned by God, Evangelist Howard has been called to uplift and encourage the people of God. The word she ministers is delivered with power, passion, humor and love. She desires to see the lives of men and women of God everywhere changed for the better. Understanding her place and call in the ministry Evangelist Howard strives to do ministry with the spirit of excellence. “A Sound Voice” Ministries™ (Touching the Community and Reaching the World), of which she is the Founder and CEO, is a ministry that spans the globe and changes lives. The ministry first does outreach in their local community, because charity does begin at home and then spreads abroad. She is also, the founder of the “Wailing Wives Intercessory Prayer Ministry™”. This ministry is designed to hoist husbands to the next level in God. Evangelist Howard leads prayer with wives from all over the country weekly, as they pray for their husbands. Evangelist Howard is the wife of Minister James A. Howard and the two of them are the proud parents of a three beautiful daughters. Evangelist Howard and her family currently reside in Georgia. She and her husband Minister James Howard, are the founders and hosts of the “In Love in Him….After We Say I Do™”, marriage conference held once a year. The purpose of this conference is to rebuild, restore, refresh and revive marriages with the desire to make those marriages stronger. Evangelist Howard and her husband James host a syndicated radio show entitled “A Sound Voice”; of which they are “Stellar Award” nominees for internet radio, they are the host of their television show entitled “A Sound Voice Live!” and they are also host on the Christian television show Atlanta Live on WATC TV 57. They are known as “The Sweethearts of the Industry”. 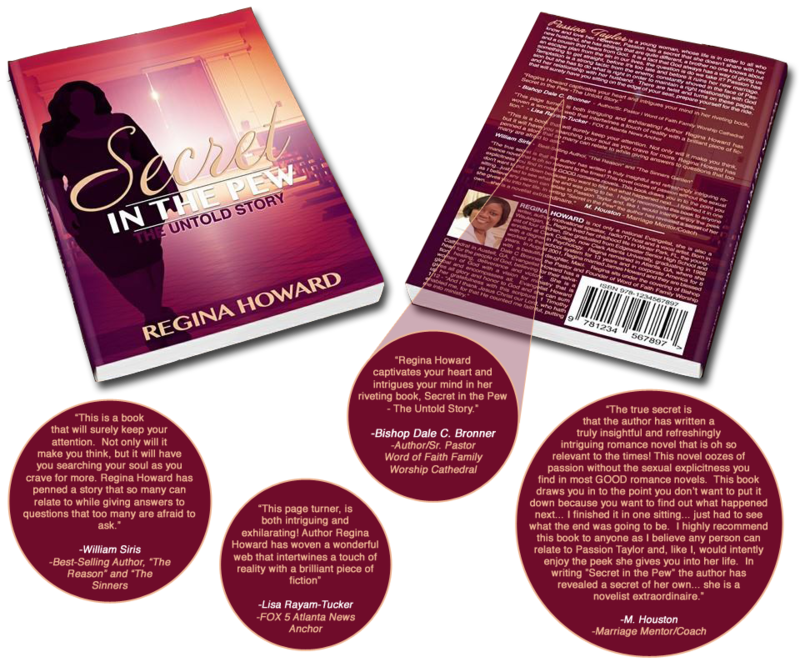 Evangelist Howard is the best-selling author of “From the Spirit to the heart of the Young” A Devotional Book for Youth and “Secret in the Pew” andsoon to be released her two newest books: “Secret in the Pew Passion’s Progress ~ No More Secrets” and “Water from the Well” A Devotional Book for Wives”. She is proud of her accomplishments but she knows it is all because of Christ. She can sum her call and love to the ministry up with this scripture: 1st Timothy 1:12: "And I thank Christ Jesus our Lord, who hath enabled me for that he counted me faithful, putting me into the ministry." © 2014 Regina Howard. All Rights Reserved. Site By: ID Graphics, Inc.